ABC games and alphabet activities are a great way to work on letter recognition, matching lowercase to uppercase letters, phonics, and more! Teaching the alphabet doesn’t have to be boring and frustrating. But it can be hard to come up with creative ideas to get little ones excited sometimes. When it comes to learning the alphabet, children learn best when they are using hands-on play — just like any other area of learning. Thankfully, there are lots of abc kid games to choose from that will invite your little learners to explore the alphabet. 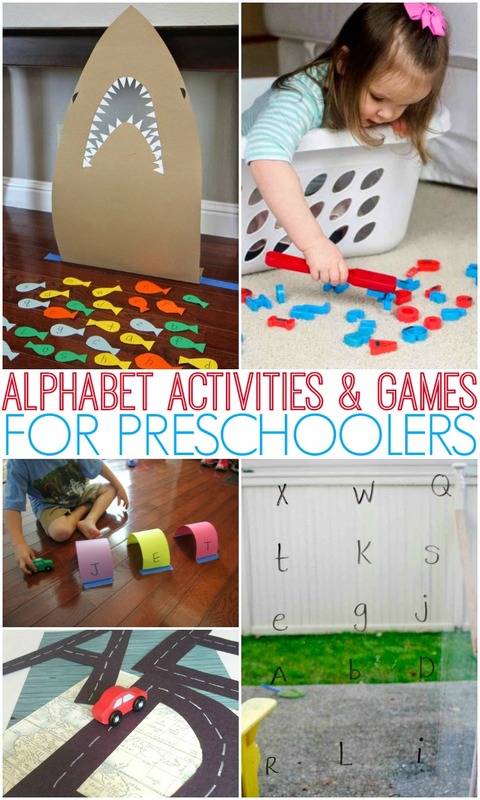 ABC games and alphabet activities help children with pre-reading and pre-writing skills, and they are best to introduce when children start talking about the alphabet or showing interest in it. When children see letters on paper and try to name them, they are showing interest in learning about the alphabet. When they start “pretending” to read books, they are interested in learning more. And little by little we can help them put the clues together to figure out how to put all the pieces together. 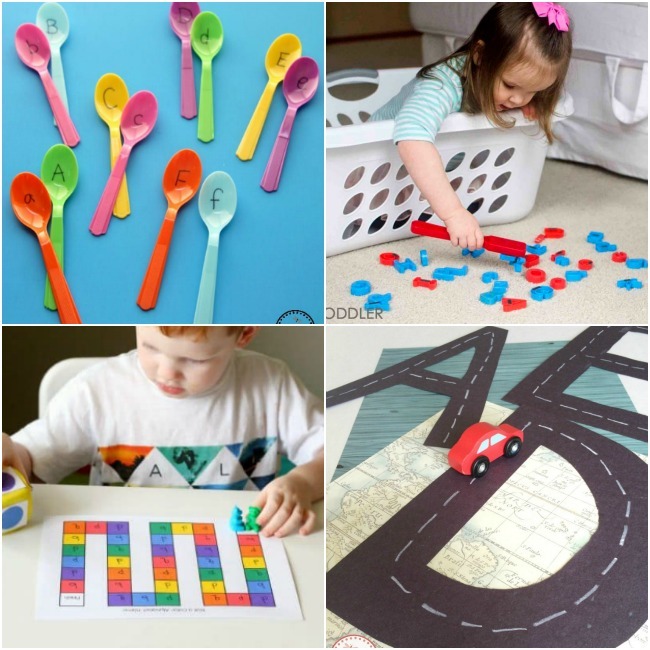 Here are some of our favorite hands-on abc games that will be a teacher all their own and make learning the alphabet fun! Feed the Puppy Alphabet Game – This ABC game is so inviting as children get to feed this puppy a delicious alphabet treat! Craft Stick Letter Match – Use craft sticks to make this fun letter matching game for lower case and upper case letters. Feed The Shark Alphabet Game (pictured) – This hungry shark is ready to eat up the letters of the alphabet. Use this for an ocean theme or just an inviting way to work on letter recognition. See and Spell Game – This puzzle is a great way for children to work on matching letters and forming words! Erase The ABCs (pictured) – Children will love hunting for and erasing letters in this fun letter game! Magnetic Chicka Chicka Boom Boom Tree – Make this beloved story into an inviting magnetic abc game! Alphabet Scooping Game – This abc game is so inviting and a great sensory activity too. Fish Matching Game – What I love most about this alphabet kid game is the spray bottle! Children will work on fine motor skills while learning about the alphabet, and if they’re anything like mine, they’ll beg to play over and over again! Bottle Cap Letter Matching Game – This bottle cap matching activity is so inviting and uses fine motor skills too! Egg Carton Alphabet Game – When it comes to simple letter games, this one is fantastic! You just need an egg carton and alphabet pieces. Alphabet Matching Sensory Tray – This is a brilliant way to make a literacy matching game! See it in the video below! Butterfly Alphabet Matching Bin – Grab the butterfly alphabet printables to work on letter matching and symmetry at the same time! Letter Sounds Alphabet Game – Letter games are the best when it comes to teaching phonics, and this game does exactly that! Grab a die, a counting bear (or anything similar), and help your child work on letter sounds! Cupcake Liner Matching Game – This matching game is a perfect way to work on upper case and lower case matching. See it in the video below! Learning Letters Game Maze – Make a maze on the floor and grab a favorite vehicle to go pick up all the letters! Alphabet Tunnel Play (pictured) – Get those vehicles ready to race under the alphabet tunnels! Paper Cup Letter Recognition Activity – Grab some paper cups for this simple and fun letter matching game! Paper Airplane Alphabet Game – Make a paper airplane and have it zoom onto a letter for the child to name! Spoon Letter Matching Game – This alphabet matching game is so fun and super simple! See how it is done below! Racing Letters Alphabet Game (pictured – bottom left) Work on this abc game and help little ones work on letter formation! Alphabet City – Using a play mat, some alphabet pieces, and a car, grab all the letters in the city! Alphabet Connect The Dots – Make a sticker wall and have children connect the alphabet! Roll and Dot the Letter – Use do-a-dot markers, a homemade die, and the printable for this fun game in the video below! ABC Magnet Fishing (pictured – upper right) Go fishing for the alphabet with a favorite science tool! Letter Matching I Spy Wall – Grab some dot stickers and make this simple and inviting abc game for kids! ABC See Hear Do – This learn to read book combines movement and animal sounds to learn letters sounds, and it is brilliant!